Enthusiasts see the rise of crossovers as the anticipated arrival of Damien Thorn from “The Omen,” signaling the coming of the Antichrist. Not only are crossovers practically killing sedans, coupes, and hatchbacks, but they’re pointless. The majority of crossovers aren’t fun to drive, nor are they as versatile or capable as traditional SUVs. The 2019 Mazda CX-3 proves that this sentiment isn’t true for all crossovers, at least in one specific regard. Mazda’s miniature crossover is a mash-up of vehicles, sharing the platform from the excellent Yaris (Mazda2 in other parts of the world), a design that’s similar to the old Mazda3, and a comparable powertrain as the Mazda3. It’s also a mash-up of size. It’s similarly sized to a Mazda3, but slightly taller. And there’s the rugged body-cladding around the entire body, which is what crossovers are all about. In my eyes, Mazda can do no wrong. 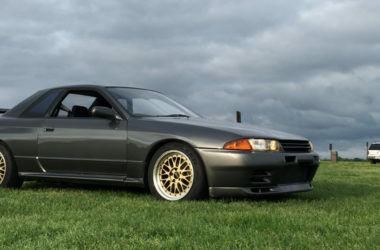 The Japanese automaker is the champion of making vehicles that are fun to drive for the regular consumer that isn’t prepared to go through Michelin Pilot Sport tires every 10,000 miles or give up their fancy Bose audio system (in the name of weight reduction bro). Park a Mazda in your driveway, and you’ve secretly earned the respect of every enthusiast. I really wanted to like the CX-3, but I came away from the vehicle conflicted. To put it simply, this is a car that’s fundamentally flawed and only exists because it needs to. It does, though, live up to Mazda’s standard of being an absolute hoot. 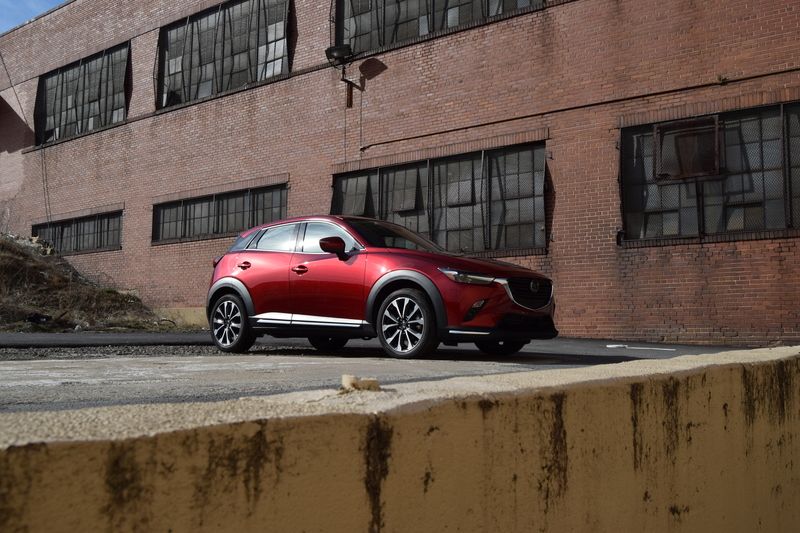 The CX-3 looks like the Mazda3 that put on some muscle to get ready for summer. You still get the same curvy, handsome design that’s found on the Mazda3, but the haunches are bigger, the front and rear ends more muscular. The sloping roofline is fantastic, and because of the blacked-out B-, C-, and D-pillars, it has a floating appearance. Nearly every crossover has black body-cladding and it’s the same with the CX-3. It does make the crossover look more rugged, but that’s about it. Mazda dropped the keys off to a CX-3 in its range-topping Grand Touring trim. While the entry-level Sport is handsomely equipped, the Grand Touring brings a bunch of upscale features. Adaptive LED headlights, heated side mirrors, dual exhaust outlets, 18-inch wheels, LED taillights, and a roofline rear spoiler are standard. 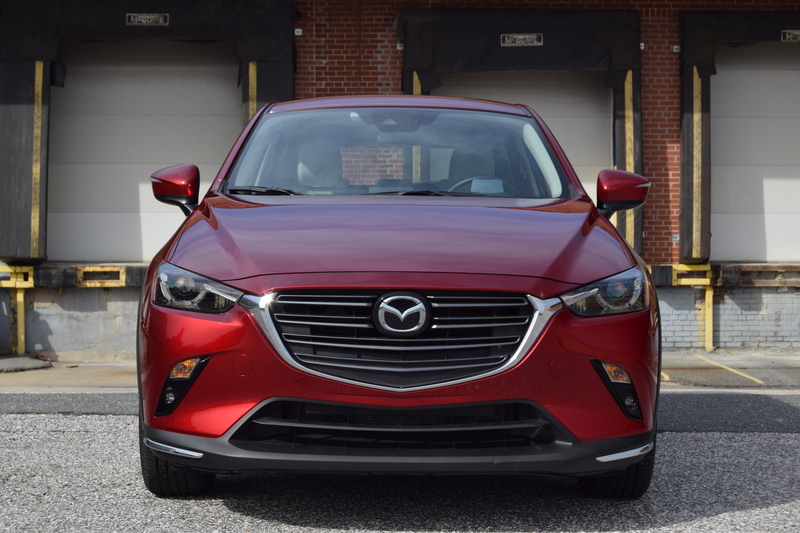 Sure the CX-3 looks good, but so does the Mazda3. 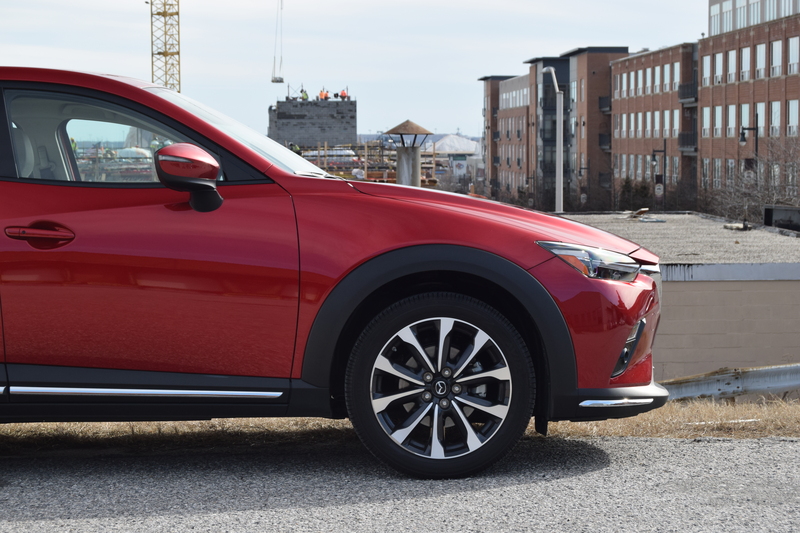 With the brawny design and the essential body cladding, one would assume that the CX-3 is a much larger vehicle than the Mazda3, but that isn’t the case. Putting my consumer hat on for a minute, drivers love crossovers because they perceive them as having extra ground clearance – a necessity when dealing with the inch of snow that’s on the ground. 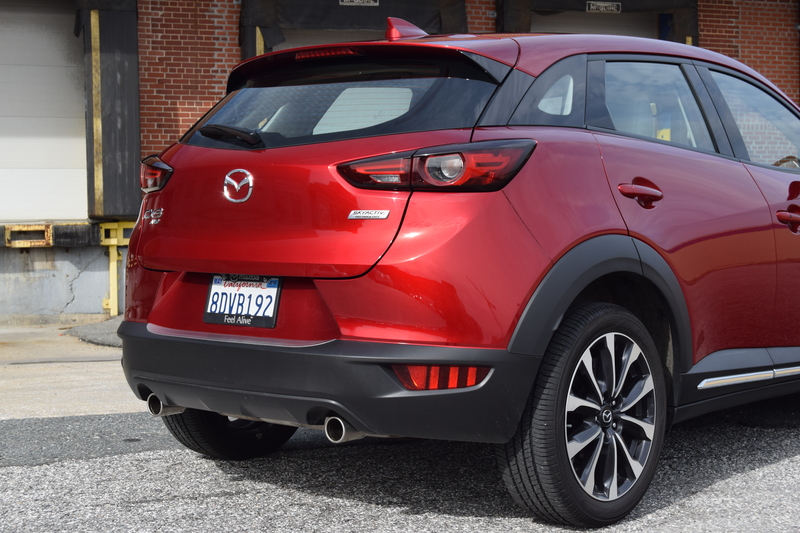 That’s fine and dandy, but here’s a look at how little really separate the CX-3 from the Mazda3 hatchback. 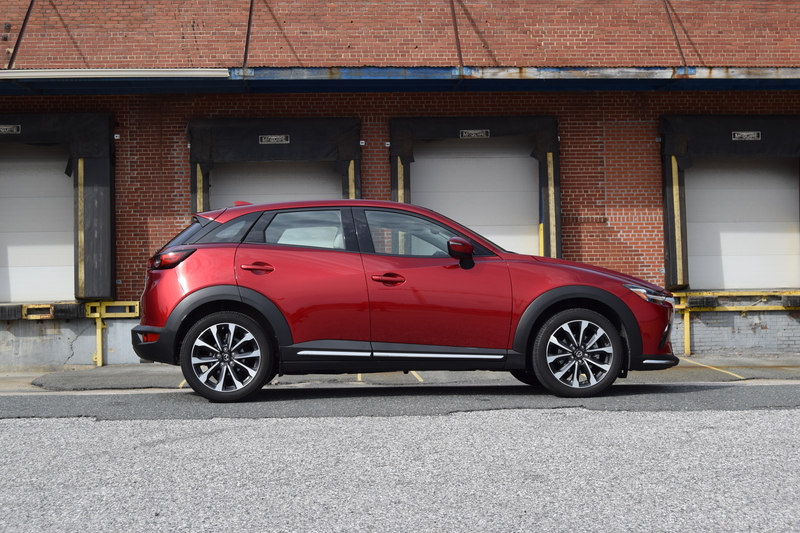 The CX-3 is 3.6 inches taller than the Mazda3, but 7.3 inches shorter and 1.1 inches smaller in width. 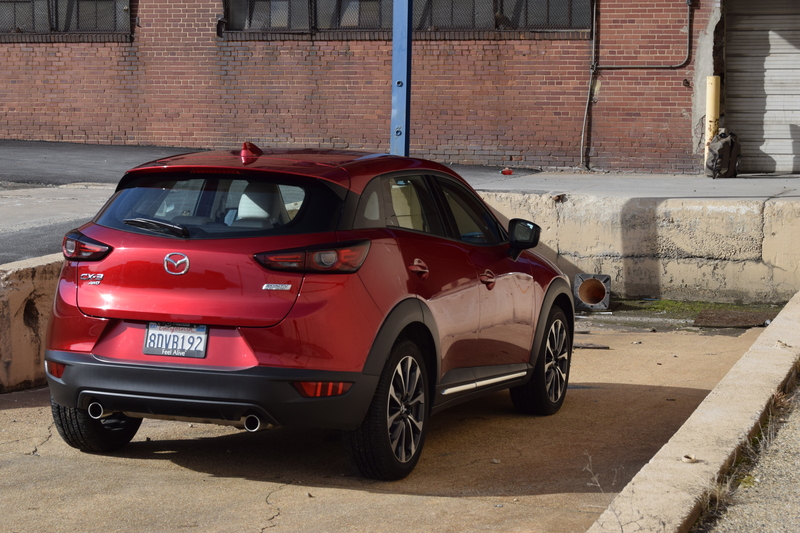 Those figures don’t reveal much, besides the hatchback is actually larger than the utility-oriented CX-3. But what you need when it snows is ground clearance. Staggeringly, the Mazda3 has 6.1 inches of ground clearance. Care to guess how much the CX-3 has? Seven inches? Eight inches? Nope, the rugged, CX-3 has 6.2 inches of ground clearance. All of that body cladding and muscles results in a puny 0.1 inches of extra ground clearance. In other words, it’s easy to be fooled by the CX-3’s attempt at looking tough, but it’s not. If you want something that’s capable for that one time of the year it snows, a CX-3 with front-wheel drive will be just as capable as a Mazda3 hatchback, despite having that rugged look. 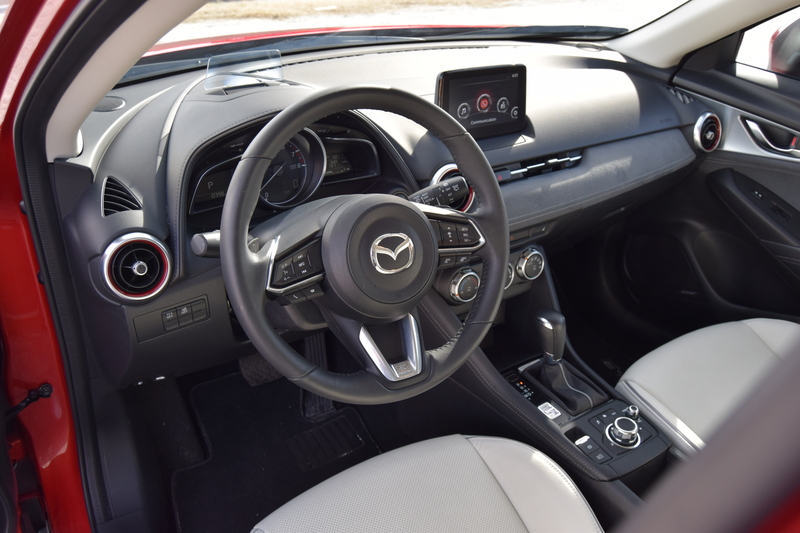 It’s typical Mazda on the inside of the CX-3, which is to say gorgeous. Simple, elegant, and easy to use, the design of he CX-3 is one of the crossovers strong points. The large, centrally-mounted tachometer and Sport mode are indicative of the CX-3’s sporty character. 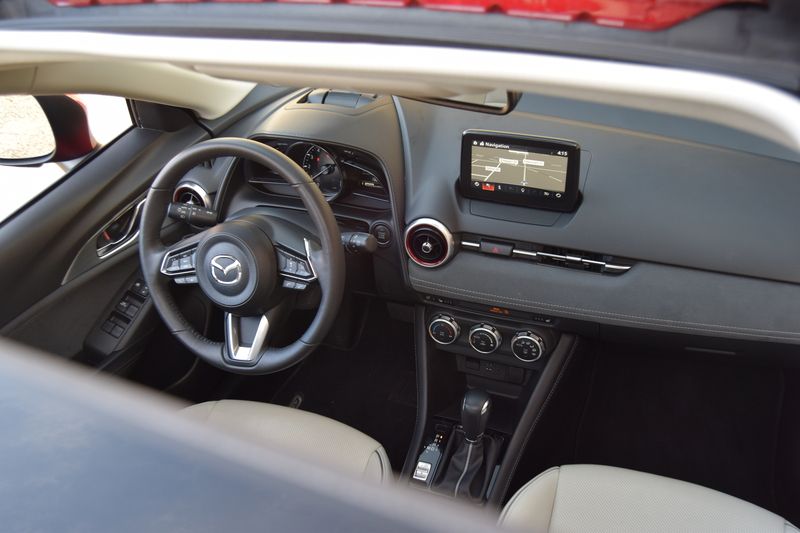 Mazda’s easy-to-use infotainment system is on hand, though it lacks Apple CarPlay and Android Auto. Still, with well-placed buttons for the infotainment screen, not having those systems isn’t a deal breaker. Mazda always does the small details extremely well, and the faux suede dashboard and circular vents with red trim are exceptional. 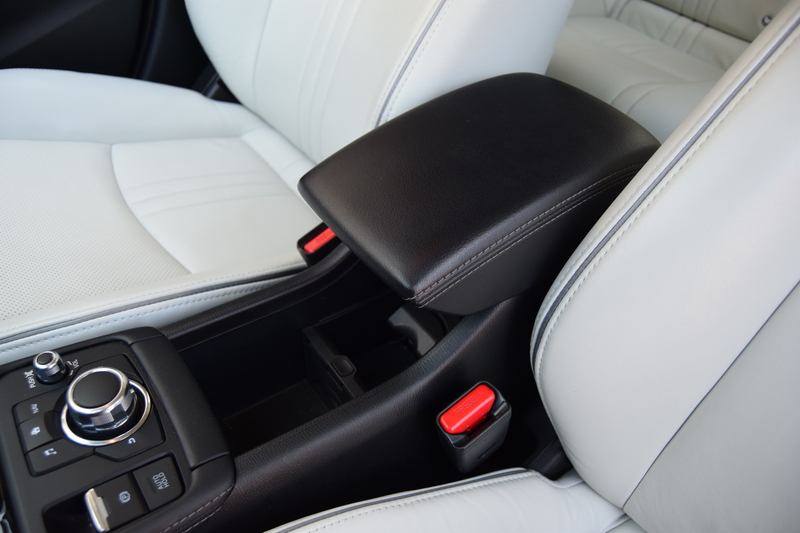 Opt for the Grand Touring trim, and you’ll get things like automatic climate control, which is controlled via a hefty, easy-to-use dial, a moonroof, leather-trimmed sport seats, heated front seats, paddle shifters, a 7-inch display, a Bose 7-speaker audio system, and a head-up display. As far as design goes, even Jake Gyllenhaal’s character as an art critic in “Velvet Buzzsaw” would find little to complain about. The main letdown comes in the form of interior space. 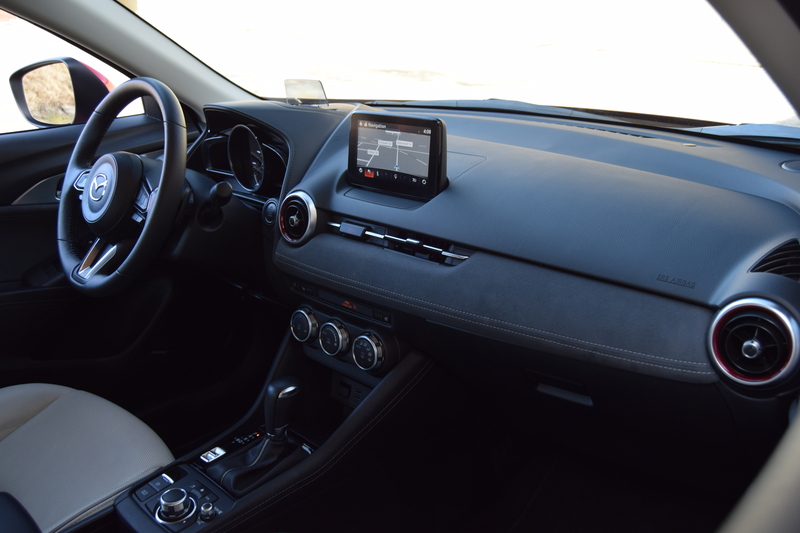 For the driver and the passenger in the front, the CX-3 is fine, and spacious enough. 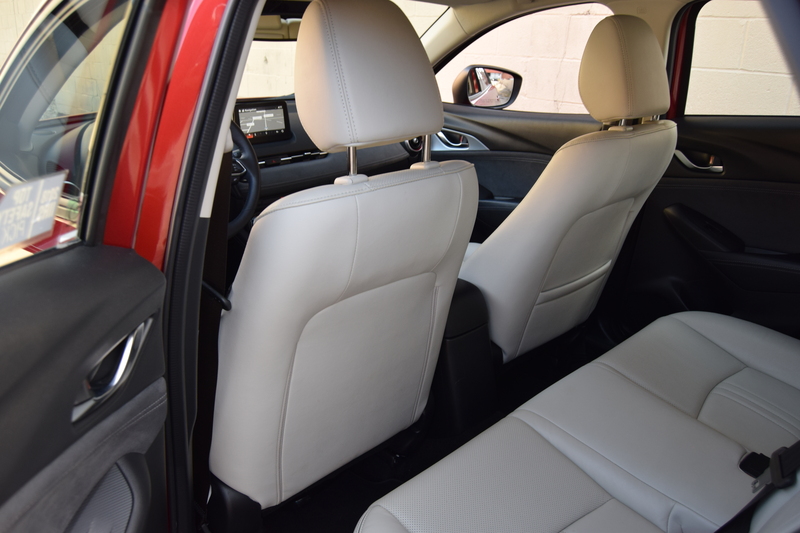 But even look at the rear seats and you’ll get an overwhelming sense of claustrophobia. Don’t have a fear of tight spaces? You will if you spend any amount of time in the back of the CX-3. With the driver’s seat in my preferred position, my knees were up against the back of the front seat if I decided to slide into the back seat. The sloping roofline that looks so great from the outside also eats into rear headroom. Without bringing out boring numbers, the Honda HR-V and the Hyundai Kona have more interior space. But one would overlook the rear-seat situation. You might not need a set of rear seats. Heck, it’s just you and your significant other 90 percent of the time. Why bother with a set of rear seats? Fine, that makes sense. But what doesn’t is the scarcity of cargo space, especially for something that’s billed as utility vehicle. Numbers have to be brought out for this one, because they’re downright appalling. 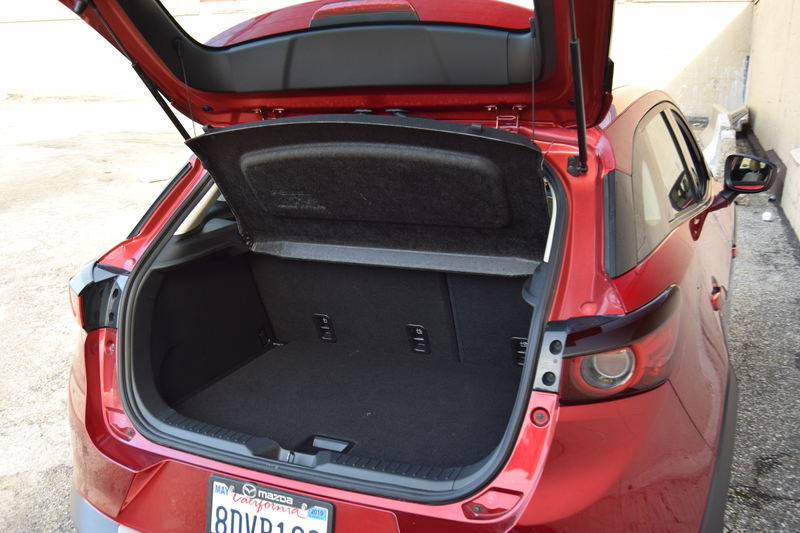 With the rear seats in place, the CX-3 has 12.4 cubic feet of cargo space. That’s less than the Toyota Yaris sedan (13.5 cubic feet) that I tested not so long ago. That’s less than what you can get in a Ford Fiesta sedan (12.8 cubic feet). More importantly, it’s less than the HR-V (22.3 cubic feet) and the Kona (19.2 cubic feet). What I don’t understand, is how it’s so far off of what the old Mazda3 can hold, which is 20.2 cubic feet. The CX-3 is only offered with one powertrain and it’s a decent setup. Power comes from a 2.0-liter four-cylinder that makes 148 horsepower and 146 pound-feet of torque. 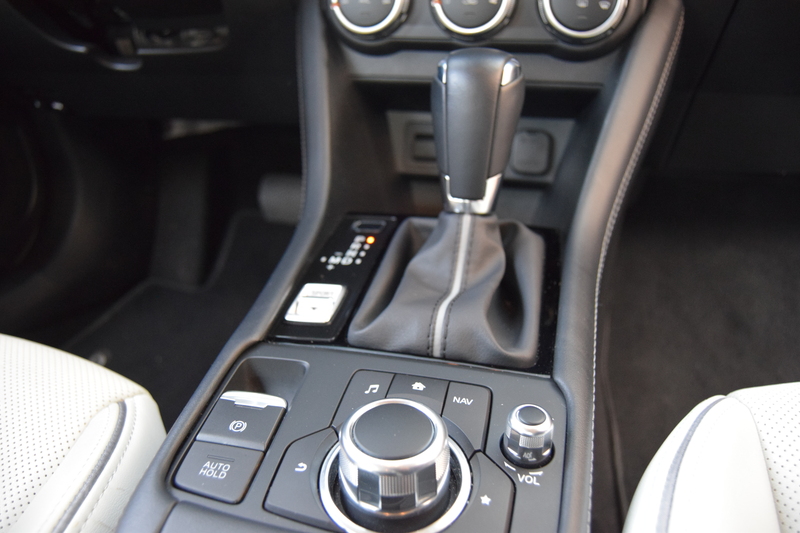 Shifts are handled by a six-speed automatic transmission, which shuffles power to the front wheels. The most crucial aspect of the CX-3 is that an all-wheel-drive system is available. It’s not on the old Mazda3, but is on the new one. The combination isn’t anything to write home about, but fine for daily use. It’s not the best-sounding engine in the world, and a coarse note makes it way into the cabin when pushed hard. But it’s got enough pep and shifts are quick enough. There’s a Sport button that can be pressed to make things a little livelier and paddle shifters, which clash with the whole I’m super rugged thing, but the CX-3 is adequate in the performance department. What the CX-3 does really well is get good fuel economy. The crossover has an EPA rating of up to 29 mpg in the city and 34 mpg on the highway with front-wheel drive. All-wheel drive brings those figures down by two in each setting. With such a low hit from all-wheel drive, it’s worth the extra money to get. 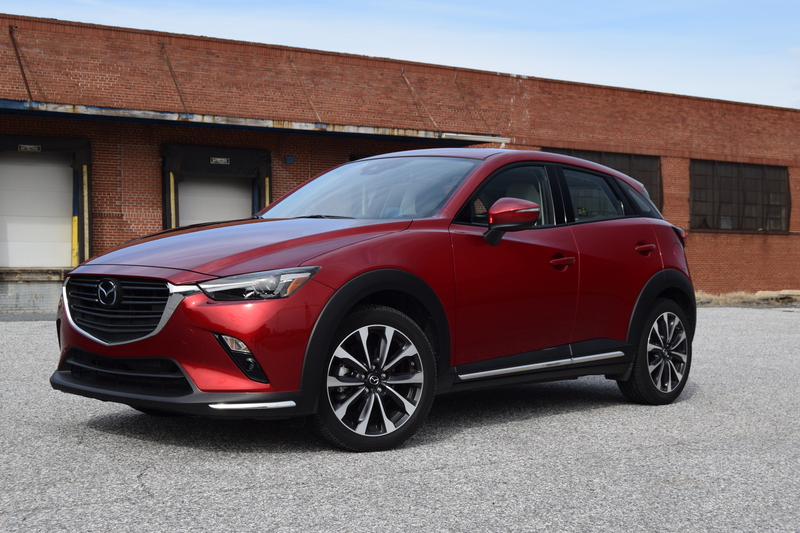 Plus, pointing out the obvious here, if you go with front-wheel drive, there’s really no reason to go with the CX-3 over the Mazda3, as the smaller vehicle is more efficient. EPA ratings for the Mazda3 are up to 28 mpg city and 37 mpg highway. You’ll be too busy enjoying the CX-3 on a good road to care about fuel economy, though. 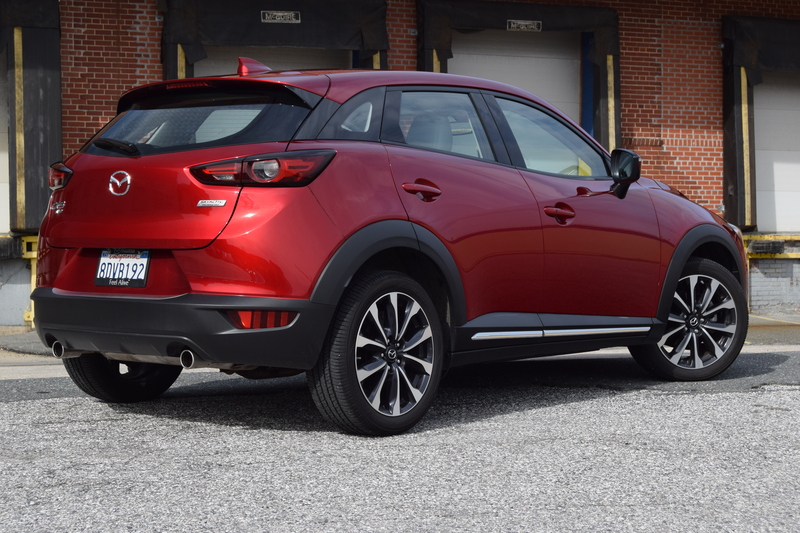 Thanks to the Mazda2’s chassis, the CX-3 is a joy to drive. The CX-3 is a calescent crossover, nearing a hot hatchback in driving pleasure. It’s athletic, fun to drive, agile, and any other words you can think of to describe as being enjoyable. Since the vehicle isn’t really that much different from the Mazda3 and has stiff suspension, body roll is kept to a minimum and there’s a direct sense of what’s happening beneath the surface. Get on a good road, and the CX-3 proves that not all crossovers are built from the same, boring cut of cloth. Unfortunately, few crossovers find themselves searching for a good road on a lazy Sunday, instead opting for something that can take them to get their caffeine fix at a local coffee shop in comfort. In that regard, the CX-3 struggles immensely. The ride is stiff, coming awfully close to being jarring on rough roads. If you find yourself having to use the restroom when driving the CX-3, you’ll feel every imperfection on the road, and curse at yourself for not using the restroom before gulping down that iced macchiato. If you’re the owner for a CX-3, you have undoubtedly earned my respect. This vehicle is a true driver’s car through and through. Unlike the majority of modern vehicles – especially crossovers – it requires a lot of compromise in the name of driver enjoyment. The cabin is cramped, it’s loud at any speed, and the ride is bladder jostling. But at the end of the day, it’s good fun to drive. Show me a sports car that requires this much compromise, and I’ll show you the CX-3. I salute you CX-3 owners, for purchasing this car and sticking with it, because even if I consider myself a diehard Mazda fan, there’s no way I would ever buy one or recommend that someone else would. If you want a crossover that can actually seat four and carry more than a bundle of bananas from Costco, go with an HR-V or a Kona. You might give up some driving enjoyment, but they’re better all-round vehicles. Here’s the thing, though. What’s wrong with the Mazda3 hatchback? 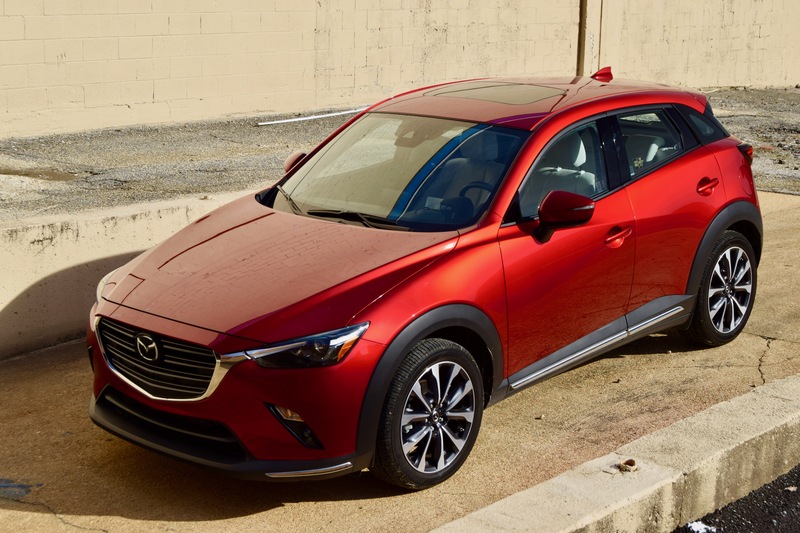 It’s cheaper than the CX-3, has more power, more cargo space, a similar amount of ground clearance, and can be had with a manual transmission. It’s probably more enjoyable to drive, too. The CX-3 purely exists to scratch an itch. It’s a way for Mazda to say, yes, we have a vehicle that can compete in this segment. But in actuality, the Mazda3 has always been the answer, and with the addition of all-wheel drive for the new generation, there’s no point in buying a CX-3. If you did found yourself getting lulled in by the available all-wheel drive system, taller design, and body cladding, you got taken for a ride. Or in the words of DJ Khaled: “Congratulations, you played yourself.” Sorry Mazda. I love you, but the CX-3 doesn’t make any darn sense.